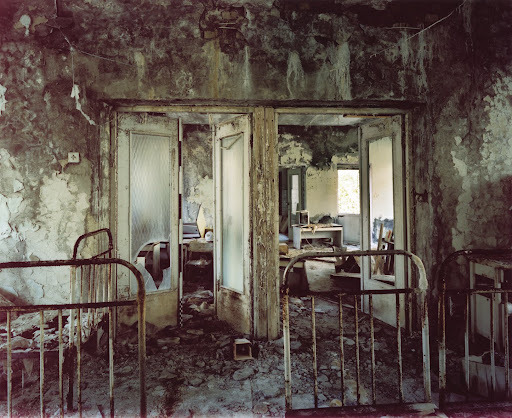 Aesthetica Magazine Blog: 1986 Chernobyl: Jane and Louise Wilson, John Hansard Gallery, Southampton. 1986 Chernobyl: Jane and Louise Wilson, John Hansard Gallery, Southampton. Jane and Louise Wilson were born in Newcastle and currently live and work in London. Using film, photography and sculpture, the Wilsons have created a series of internationally acclaimed, highly theatrical and atmospheric installations that investigate the darker side of human experience. They first began working together in 1989 and have since been fascinated by institutional architecture and the power of the unconscious mind, creating a body of work which probes collective anxieties and phobias, arouses unwanted memories and reveals things which are usually repressed. In summer 2010, Jane and Louise Wilson made their first visit to the deserted city of Pripyat, Ukraine, inside the 30km Exclusion Zone around the site of the disaster, arguable the greatest ecological catastrophe humankind has every seen. This summer a series of large-scale photographs from their ongoing investigation into the 1986 Chernobyl nuclear disaster premieres at the John Hansard Gallery, alongside a number of other works, many previously unseen in the UK. Shortly after the accident at the Chernobyl Nuclear Power Plant in 1986, 135,000 people were evacuated from an area extending 30 kilometres around the damaged reactor. Pripyat, known as The Atomic City, was the ninth nuclear city (atomograd) in the former Soviet Union and considered one of the finest places to live. There were all the amenities of a modern Soviet city, with schools, shops, hospital, recreational and cultural facilities. At the time of the accident Pripyat had a population of 45,000 people. It is now uninhabitable and will never be lived in again. 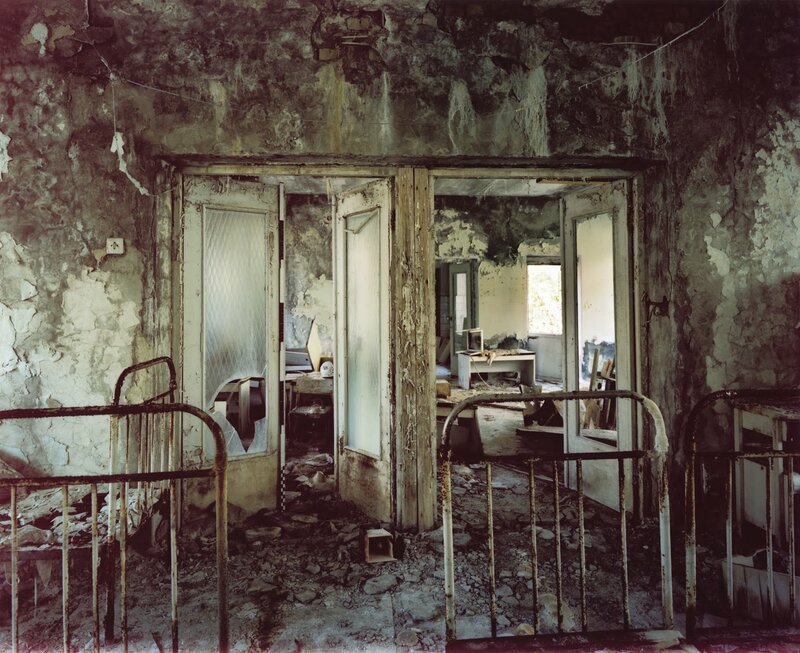 Atomgrad (Nature Abhors a Vacuum) (2010) is a suite of eight photographic prints depicting deserted interiors from the abandoned town of Pripyat. Books remain on shelves and desks, bed frames remain intact and once-exquisite parquet floor lies on the ground like rubble. A yardstick appears within each image and is a recurring motif throughout the exhibition. These objects of measurement - functional yet obsolete - act as a marker of scale and order, alluding to the tensions between association and analysis, memory and material fact. Other works featured include two from the photographic series The Oddments Room (2008-9) made in an antiquarian bookshop in London which functions as a book 'hospital' for incomplete first and second edition books, creating a link with the historical past. Books are stacked claustrophobically, floor to ceiling, categorised by subject. Faulty, dysfunctional or ruined, yet still of great value, whilst they lie in waiting there is an assumption that someday they will still be cared for. The yardstick against the shelf of Oddments Room IV (A Canoe Voyage up the Minnay Sotor) (2008) acts a measure of space and scale, and suggests too a measure of time. In the accompanying photograph Oddments Room V (Atlas) (2009), the yardstick is replaced by a lone female figure in ‘40s black and white checked dress, standing in the doorway with her back to the viewer, as though on the threshold between past and present. Further yardstick sculptures are mounted along the wall and floor of Gallery Two. Altogether (2010), constructed from multiple yardsticks questions the nature and limits of measurement and Measure Obsolescere (2010) acts as a register of scale between three-dimensional and photographic space. New photographs from a recent work Face Scripting: What Did the Building See? (2011) investigate the algorithmic technology of face recognition where unique individuals are identified from the blankness of crowds. Jane and Louise Wilson continues at John Hansard Gallery until 10 September. © the artists. Courtesy 303 Gallery and Helga de Alvear Gallery.